President Trump took a shot Tuesday at the NFL's tax breaks. What he didn't say is he has had a long-running grievance with America's most popular sport. Trump attacked the NFL in a tweet, saying the league should lose tax breaks because of the player protests during the national anthem. Back in the 1980s, Trump became owner of the New Jersey Generals, one of the teams in the upstart USFL, which was trying to become a rival to the NFL. The USFL, which eventually failed, had some success playing games during the spring. But Trump and some of the owners pushed to move its schedule to the fall so it could go head-to-head with the NFL. Trump also pushed for it to file an antitrust suit against the NFL, arguing it was illegally restricting competition. The USFL won the suit, but it was awarded all of $3 in damages. It soon went out of business. 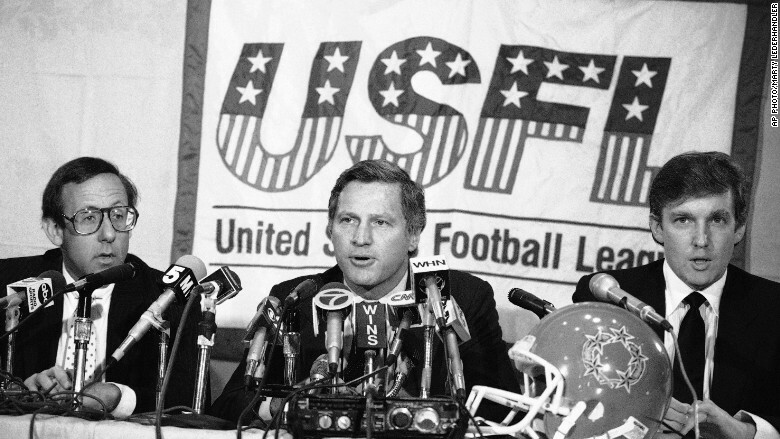 Donald Trump, right, at a 1985 press conference about the USFL. Trump continued to pick fights with the NFL. In 2013, Trump attacked NFL rule changes aimed at making the game safer for players, calling them "the beginning of the end" for the NFL. The NFL has attempted to reduce concussions, which have been tied to traumatic brain damage. Trump echoed his longstanding complaints about those efforts recently in the same speech in which he urged players participating in the anthem protests be fired. "They are ruining the game, right? They're ruining the game. Look, that's what they want to do. They want to hit. They want to hit.," he said. Trump also tried to buy one of the league's teams, the Buffalo Bills, in 2014, but lost out to a local businessman. 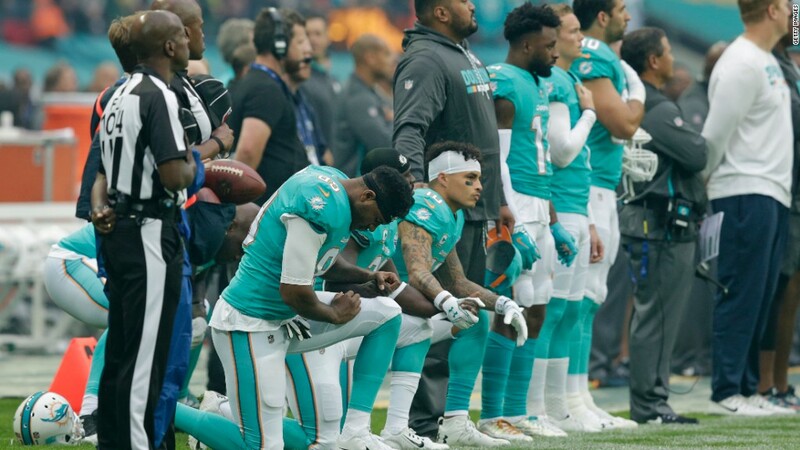 Trump has been complaining for weeks about the NFL players taking a knee during the playing of the national anthem, which some players have done in order to protest treatment of African Americans by police. His complaints only prompted more players, and some owners, to join the protest. On Sunday, Vice President Mike Pence left a game he was attending in Indianapolis due to the protests. On Tuesday morning, Trump called for the NFL to be stripped of tax breaks. It's not clear exactly which tax breaks he was referring to. The NFL does benefit from tax breaks. Teams often receive breaks on property taxes, or they get to use tax-free bonds to build new stadiums. That tax status on the bonds allows them to pay lower interest rates. They also get direct help from taxpayers in the construction of stadiums. Most of that help is from local and state governments. The NFL had benefited from its unlikely status as a not-for-profit organization, allowing it to collect billions in revenue and pass the money along to individual teams. But the league announced in 2015 that it would gave up that status voluntarily. And the not-for-profit status was one of the smaller tax breaks it received. The league saved only about $10 million a year from the tax break, according to the Citizens for Tax Justice. That's a rounding error for an enterprise the size of the NFL. NFL spokesman Joe Lockhart told reporters Tuesday that the league gave up its tax exemption in 2015 because it was too much of a distraction. He denied the status provided even a modest tax break, because the tax liability was passed on to the clubs. Lockhart defended state and local taxpayer support for stadium construction, arguing that it provides economic benefits to the communities. Many economists dispute those claims. The White House said the fact that taxpayer dollars are used means there's an expectation of decorum. "If this industry is going to use money from American taxpayers to build the very fields they play on, is it really too much to ask that they show respect for the American flag at the beginning of the game?" White House press secretary Sarah Huckabee Sanders said Tuesday. As for federal tax breaks, Lockhart said, the league has "nothing really to give up." In terms of federal taxes, the biggest tax breaks the NFL benefits from are indirect. Corporate customers that spend billions on luxury boxes and other premium seats, as well as on sponsorship deals and advertising on games, get to deduct those expenses when calculating their profits and tax bills. But it's unlikely that Trump or Republicans are interested in making it tougher for corporate America to deduct those kinds of expenses as part of tax reform.